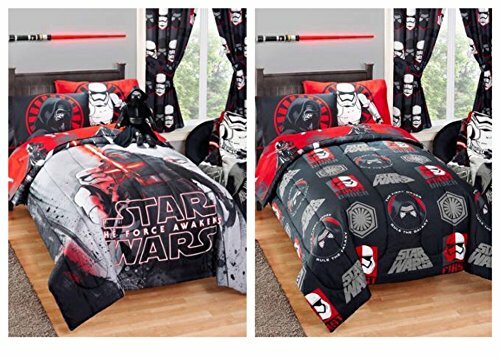 Star Wars Kylo Ren Reversible Kids Twin / Full Size Bed Comforter - 72" X 86"
Boys and girls will love the look and feel of this Star Wars reversible bed comforter. It may be paired with a variety of Star Wars bedding sheets and accessories. The comforter fits twin or full size bed and reverses for two different looks. Made with super soft polyester microfiber for durability and comfort. Features Kylo Ren from the Star Wars movie and toys. For kids or toddler room decor. Machine washable. Ages 3+.